This article was adapted from an article from the Fall 2009 edition of Kitchen Views Design Magazine. The island is about as common in today’s kitchen as the stove, refrigerator, or microwave. However, unlike those particular appliances, the island can serve a wide variety of purposes and come in many different shapes and made of many different materials. For homeowners, deciding on what type of kitchen island works in a particular space can become a pretty daunting challenge. Having a sense of how the space will be used, however, can make a big difference in how to cross that bridge when your design gets to it. It’s important to know how your island will be visited each day, invariably shaping the content of its cabinets, dimensions, and surface. Some islands are used as much for food prep as they are for homework. The island can also be the most important piece of the puzzle in the workflow of a cook entertaining a houseful of guests. 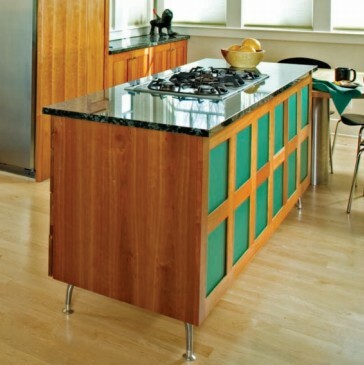 Here are four kitchen island solutions, each with its own advantages, in order of price point. This portable island, created with Schrock cabinets, is little more than a countertop installed upon two cabinets and two shapely legs, offering just enough space to savor a moment of solitude and a morning latte before the action begins. As walls come down and the kitchen and family rooms merge, an island with a high bar for seating and a lower level for food prep keeps the mess out of sight and the flat screen right where you want it. 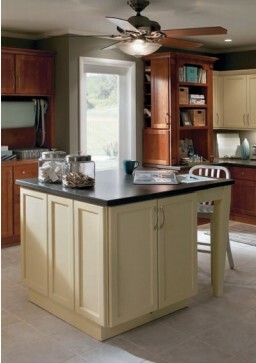 Mixing and matching Dynasty and Omega cabinetry help to create this custom look at an economical price. You can show off your cooking skills and remain part of the party by incorporating a semi-pro island cooktop. 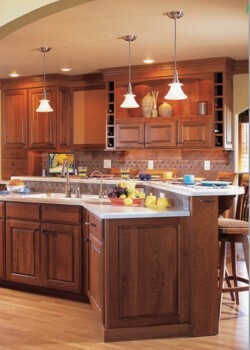 A bold splash of color in natural cherry cabinetry by Corsi adds panache to this focal point. However, before you set your heart on this plan, remember that ventilation in the middle of a room requires strategic planning. Carefully planned storage space requires considerable discussion when designing an island, even in a colossal kitchen. Add two levels, with a prep sink above and a wood-topped baking center below, and this five by eight foot island by Crystal Cabinetry provides a bevy of solutions for the multi-cook family. 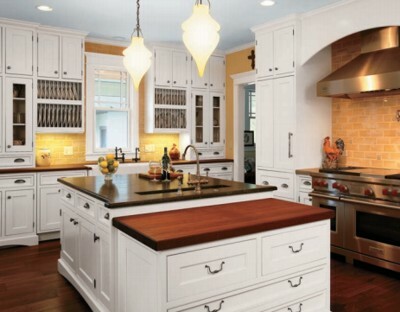 These and many more solutions exist for finding the right island for your kitchen. Speak to your designer about how to best utilize this centerpiece of your kitchen to fit your needs.